2-11-2017 – 6:30AM – 20-36 inches of fresh snow out on Mammoth Mountain over the last 36 hours. Snow conditions are great with all that rain soaked snow now covered up from the new snow. The base out on the hill is now up to 178 at Main Lodge and 340 at the top of the Mountain. Yes those numbers are right, I have only seen this much snow 5 or 6 times in my years up here. The weekend should be great with fresh snow off the groomers and packed powder on the groomers. Look for fresh powder on 5, 9, 14, 23 and G2. There is a large crowd in town so get out to the hill early for some quick early warm up runs. Locals Choice today is to watch for the top to open and then get up there to sample some powder and one the deepest base’s we have ever seen. The weather at this time shows pt skies we have now added in a 40% chance of snow showers that could add up to about an inch of new snow. Expect north winds 40-55 MPH. Highs out on the hill will be in the 20’s today with lows in the single digits tonight. By Sunday we clear out and we get NE winds 35-45 MPH over the upper elevations of the hill, highs will climb up into the low to mid 30s. Use this link for our complete Mammoth weather discussion and long range outlook. Roads are now R1 in town and up to the Main Lodge, lots of icy spots around from melting snow so slow down. Also to note the snow piles in town are 10-20 feet high, it makes it very hard to pull a car out into traffic. Please beware that people need to slowly inch there cars into the road to be able to see traffic while pulling out of local side streets and driveways. Snowman will have some fresh images to post mid day on Sunday once the sun comes out. We want to get you a full album of the hill to show you the great amounts of snow we have. Once we get that done we plan on doing a town is buried photo shoot on Monday or Tuesday. 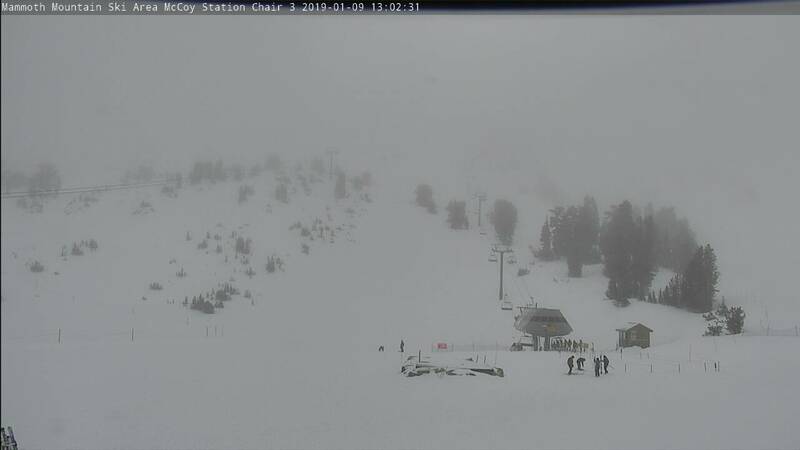 Now is the time to make plans to come to Mammoth and see and play in all this snow.